About one third of deaths among HIV-seropositive patients worldwide are due to co-infection with Mycobacterium tuberculosis (MTB). By infecting the same host, both pathogens replicate much better than alone. This syndemic is induced by a convergent dis-regulation of host immune response by HIV and MTB . HIV infects primarily T-helper lymphocytes while MTB preferentially infects alveolar macrophages; it is likely that the syndemy occurs in trans via circulating factors. Legend:MTB and HIV Syndemy. Pathway activation is represented by green arrows, whereas inhibition is depicted by red arrows. The dotted lines represent normal host immune inhibition of microbial growth that is down-regulated upon co-infection with MTB and HIV. 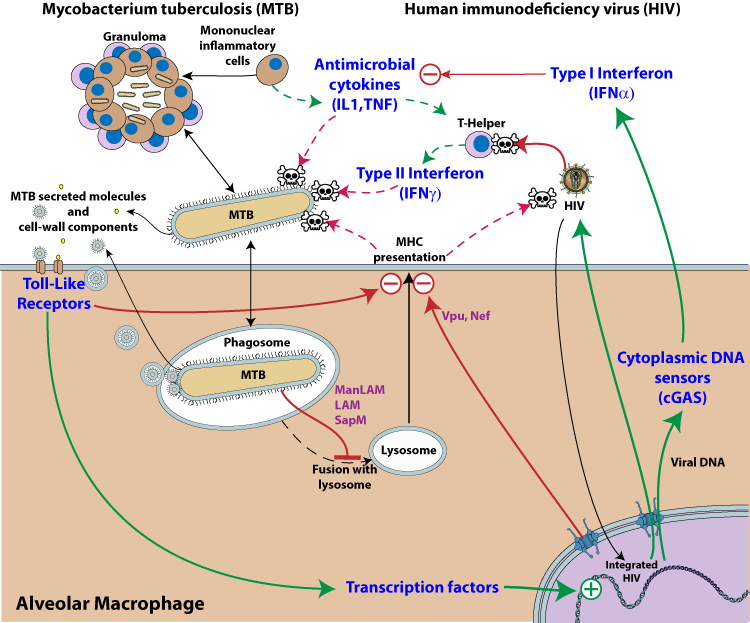 The two pathogens are represented in the same host cell, but it is likely that the mutualistic effect occurs in trans. M. tuberculosis infection promotes HIV-1 replication presumably by manipulating cellular transcription factors that regulate HIV-1 transcription . MTB cell wall components and secreted molecules interact with pattern recognition receptors expressed on phagocytic cells (e.g. Toll-like receptors), triggering various signaling pathways which in turn activate transcription factors such as NF-kappaB . Those factors bind to the promoter-proximal (enhancer) region of the HIV-1 long terminal repeat (LTR) and induce HIV-1 gene expression . This results in activation of latent provirus in cells that are reached by MTB secreted molecules. Interleukin-1 (IL-1), TNF-alpha and interferon-gamma are key cytokines that foster MTB containment . These essential cytokines are inactivated upon local HIV replication . Virus replication triggers a cGAS dependent type I interferon response, which is ineffective against the virus . By up-regulating type I IFN, HIV lowers the host defenses against MTB activity. Type I interferon and interleukin-1/TNF-alpha cytokine pathways represent distinct and specialized categories of inflammatory responses and these key mediators of inflammation counter-regulate each other . HIV co-infection also reduces the level of IFN gamma , a key element in MTB control by the immune system. Granulomas are a means of containing an MTB infection created by the immune system. This inflammatory process is characterized by the presence of macrophages, epithelial cells and multinucleated giant cells that are surrounded by a rim of T-lymphocytes. HIV co-infection modulates the granuloma aspect and cellular composition. De Noronha et al. show that HIV impairs the TNF-alpha production by granuloma cells . Furthermore, granulomas in HIV/MTB coinfected individuals have fewer lymphocytes . Walter et al. found that the presence of HIV infection in patients with tuberculosis was associated primarily with decreased induction of the MTB DosR regulon, which modulates granuloma formation and MTB persistence . MTB-antigen processing and presentation are key events in the immune response against MTB. This is stimulated by interferon gamma which is highly secreted by the immune system upon MTB detection. But antigen processing is impaired both by MTB and HIV virus. HIV interferes with antigen presentation through host modulating proteins like vpu, and nef . MTB cell wall components and secreted molecules are able to modulate immune cells and inhibit IFN-gamma secretion . It has been shown that several MTB lipoproteins, including LpqH, LprG and LprA, are key inhibitors of MHC class II antigen presentation, through activation of TLR2 . HIV also inhibits antigen presentation by redirecting MHC to lysosomes for destruction [Vpu, Nef. Credits: This page has been written in collaboration with Swiss-Prot Prokaryotic protein annotation project and co-funded by the the Swiss Federal Government through the State Secretariat for Education, Research and Innovation SERI and Swiss South African Joint Research Programme (SSJRP).